That chart is a snapshot of the credible fear and asylum processes for FY 2018. For those who are unfamiliar with those processes, aliens who are apprehended entering the United States illegally, and aliens who attempt to enter the United States through the ports of entry with fraudulent documents or no documents at all, are subject to expedited removal under section 235(b) of the Immigration and Nationality Act (INA). If "the alien indicates either an intention to apply for asylum ... or a fear of persecution," the officer making the expedited-removal determination "shall refer the alien for [a "credible fear"] interview by an asylum officer." If an alien is found to have a credible fear of persecution, that alien is placed in removal proceedings before an immigration judge to apply for asylum. 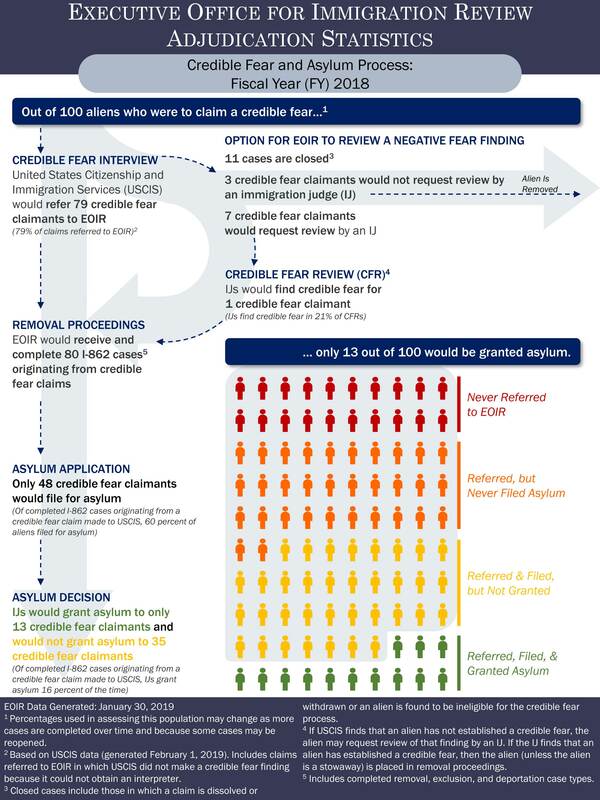 If an alien receives a negative credible-fear finding by an asylum officer, the alien can either request a credible-fear review by an immigration judge, or be ordered removed. If the immigration judge affirms the asylum officer's negative credible-fear finding, there is no appeal, with an important caveat that I will discuss below. If the immigration judge reverses that finding, the alien is placed in removal proceedings to apply for asylum. Prior to 2013, according to the White House, only 1 percent of aliens entering illegally along the Southwest border claimed credible fear. Last year, of the 521,090 aliens who are apprehended entering illegally along the Southwest border or who were deemed inadmissible, 92,959, or about 18 percent, claimed credible fear, according to U.S. Customs and Border Protection (CBP) statistics. Asylum officers work for U.S. Citizenship and Immigration Services (USCIS). USCIS statistics show that they received 99,035 credible fear cases in FY 2018. It is not entirely clear why there is a discrepancy between CBP and USCIS statistics on the number of credible fear cases, but the USCIS statistics likely reflect cases that were in the process at the turn of the fiscal year. Those statistics reveal that the agency issued 97,728 credible-fear decisions. Credible fear was established in 74,677 (over 76 percent) of those decisions, while in 9,659 cases (just less than 10 percent of the total), credible fear was not established. In addition, 13,392 of those cases (just less than 13 percent) were "closed". As EOIR explains: "Closed cases include those in which a claim is dissolved or withdrawn or an alien is found to be ineligible for the credible fear process." Therefore, looking only at the cases where a formal decision was rendered (i.e., removing the closed cases from the calculation), the positive credible-fear rate was about 88.5 percent. The EOIR chart in question breaks down the expedited-removal and credible-fear processes from beginning to end, and its statistics vary slightly from the numbers above. It explains that out of 100 aliens who claim credible fear, 79 were found to have a credible fear and referred to the immigration courts in FY 2018. Of the remaining 21 credible-fear claims, 11 cases were closed, seven credible-fear claimants asked to have their negative credible-fear findings reviewed by an immigration judge, and three credible-fear claimants with a negative credible-fear finding did not ask for review. Of the seven credible-fear claimants requesting credible-fear review by an immigration judge, one would be found to have credible fear, a reversal rate of about 21 percent. Thus, 80 of the 100 credible-fear claims cases were referred to the immigration courts to allow the aliens to file for asylum in removal proceedings in FY 2018. Of those 80 cases, only 48 of the respondents (60 percent of all cases referred to the immigration courts) would actually file asylum applications. Of those 48 applications, 13 were granted in FY 2018, and 35 were denied. This means that for every 100 credible-fear applicants in FY 2018, only 13 percent were eventually granted asylum by the immigration courts, and in only 16.25 percent of the 80 cases in which a positive credible fear finding was made were respondents granted asylum by the immigration courts. In turn, that means that 87 percent of all credible fear claimants were not granted asylum, and that asylum was denied in 83.75 percent of all cases in which there was a positive credible-fear finding. It is estimated that 100,000 aliens were apprehended entering the United States illegally in March 2019. If the trends in FY 2018 were to continue (a significant assumption, given the fact that most aliens who are now making the trek to the United States understand the loopholes in U.S. immigration laws and know they will likely be released if they make such a claim), 18,000 of them will make credible-fear claims, but at the end of the day, only 2,340 (2.340 percent of the total) will be granted asylum. What we are seeing is nearly unprecedented in the modern era. Unlike previous flows, these migrants are not arriving in high numbers, one-at-a-time. They are arriving in large groups. In a normal year, DHS would encounter one or two groups of over 100 migrants. Already in this fiscal year, we have encountered nearly 100 large groups comprised of 100+ migrants, nearly half of which have arrived in remote locations. Our men and women on the frontlines are simply not resourced to handle these levels, and I report to you today that we are struggling to transport and process — let alone adequately care for — this many individuals coming into our custody, especially those in hard-to-reach areas. The volume of "vulnerable populations" is unsustainable. Our system has been able to cope with high numbers in the past, but the composition of today's flows makes them virtually unmanageable. Historically, the vast majority of aliens we encountered were single-adult males from Mexico who could be quickly removed after a short period of detention if they had no legal right to stay. Today, the majority are families and unaccompanied children, who pose a unique challenge to the system because most cannot be easily cared for, efficiently processed, or expeditiously removed, due to resource constraints and outdated laws. The result is a dangerous and growing backlog of individuals in custody that has forced us to begin releasing large numbers of aliens, most of whom will never appear for their immigration court hearings, further exacerbating "pull" factors into the United States. Unfortunately, Alternatives to Detention, such as ankle-bracelet monitoring, have proven expensive in the long run and ineffective at ensuring removals ordered by an immigration judge. Now we face a system-wide meltdown. DHS facilities are overflowing, agents and officers are stretched too thin, and the magnitude of arriving and detained aliens has increased the risk of life-threatening incidents. At the present time, Customs and Border Protection (CBP) has more than 1,200 unaccompanied alien children (UACs) in custody, hundreds of which have been with CBP for days, an unacceptable length of stay in facilities not designed to hold children for extended periods. By law, most of these children must be transferred to the Department of Health and Human Services (HHS) for care in residential shelters. While HHS is taking steps to rapidly add thousands of shelter beds, the system is hitting peak capacity. In addition to UACs, CBP has at least 6,600 families in custody, bringing the total number of children sitting in CBP facilities to approximately 4,700. We are doing everything possible to address these numbers and reduce backlogs, but they are a symptom of a broken system. It is absolutely critical that the United States continue to grant humanitarian relief to the truly needy. The costs of granting humanitarian relief to a relatively small proportion of the claimants, however, is becoming more and more unsustainable by the day. We are facing a humanitarian crisis, as well as a national security emergency as smugglers and cartels exploit the weaknesses along the border that are than natural result of CBP's reallocation of resources to address the onslaught that the agency is facing. Congress needs to act. It does not appear, however, that they even recognize that there is a problem; if they do they are not offering any solutions. Back to the caveat. As I explained in a March 11, 2019, post, the Ninth Circuit has ruled in Thuraissigiam v. U.S. Dep't of Homeland Sec. that the provision I referred to above, which limits judicial review of expedited-removal orders for aliens who have been found by immigration judges not to have a credible fear, violates the suspension clause of the U.S. Constitution. As I noted: "This will likely lead to more appeals of negative credible-fear reviews by immigration judges, fewer negative credible-fear reviews, and as a consequence, more aliens seeking illegal entry into the United States." As a result of the decision, and at least within the Ninth Circuit, every asylum claimant at the border found not credible will now be able to litigate his or her claim to some degree in federal district court. While it is true that most — by some estimates up to 90 percent — of asylum claimants at the border pass their "credible fear" interviews (so they are immediately put into the immigration court system), most of the remaining 10 percent found not credible will now be able to seek habeas review in federal court, potentially delaying their removal from the country substantially. It is hard to know how a Supreme Court decision would ultimately turn out. But what we do know is that the crisis in Central America is pushing our asylum system into critical situation, and Thuraissigiam threatens to add yet another log to the bonfire. We need Congress to step in here. Stodder is right. But don't expect Congress to act any time soon.